In the wide world of pumps there are, surprisingly, only a few options for equipment protection. One of the more popular solutions are clam-shell covers. They are seen as an inexpensive option for protecting equipment from various problems such as caustic environments, the weather, and vandals. They provide workers with an easy way to open the cover and do a quick visual check of the equipment inside. If all that's needed is a view of the equipment, and no repairs or replacements need to be made, a clam-shell fiberglass pump cover will probably do the trick, especially if the equipment is located in a mild climate. However, they are typically made of fiberglass, which we feel is inferior to aluminum. We've compared fiberglass enclosures to aluminum enclosures before. Fiberglass is the right enclosure material for a select few environments, as we've stated before. However, it has a few issues which are especially inconvenient for pump covers. Many pump covers need to be altered or built to custom specifications. This is difficult with fiberglass as it's brittle and repairs and alterations must be completed with a variety of tools and in the perfect weather conditions. If you need to learn how to repair fiberglass or aluminum enclosures, click here. Additionally, fiberglass's color will fade over time and the material becomes brittle or gets holes in it due to UV rays. Fiberglass is also, relative to aluminum, fragile and cracks easily or even shatters. Aluminum, on the other hand, is easy to alter or customize. Adding windows, panels, vents and various other accessories is simple because of how easy aluminum is to work with. Customers can even mount the enclosure to a pump skid or make piping penetrations during installation without any worry of cracking or shattering. Marine grade aluminum, as Safe-T-Cover uses, is ideal for many environments and will stand up in the weather for decades. The way we color our enclosures means the color won't fade over time either. The most obvious difference between clam-shell fiberglass pump covers and aluminum enclosures is ease of access. If the pump equipment does need maintenance, an enclosure with removable doors or a removable roof would likely work much better. With a removable roof, the pump can be lifted entirely in and out of the enclosure. There are a couple other key differences between clam-shells and modular enclosures. For one, clam-shell enclosures typically ship pre-assembled. Modular enclosures ship flat and are assembled onsite. Surprisingly, a fiberglass enclosure is often heavier than it's similarly sized aluminum counterpart. This means you'll pay more for shipping not only because the fiberglass is taking up more space, but it also weighs more. Once again, because clam-shells are typically made of fiberglass, you'll have to worry about damage in transit. Sometimes the enclosures arrive cracked. 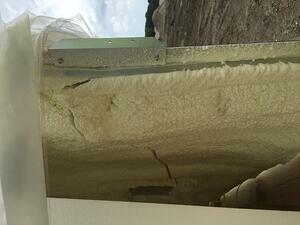 Another big difference between the clam-shell enclosures we've seen and Safe-T-Cover's enclosures is the insulation. We use polyisocyanurate panels which are laminated to a glass fiber reinforced facer on each side. Most clam-shells have spray-in insulation, which has a rough consistency that can trap dirt and other debris. Once again, it's prone to crack during shipping. Modular enclosures, like ours, are made of panels. This means that any panel can become a removable panel or door, and that equipment can even be mounted to the side of a hinged panel for quick access. 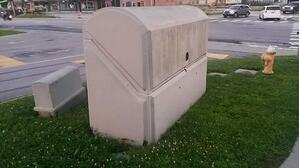 You can't exactly get away with mounting a control unit to the side of a clam-shell enclosure. At first, a clam-shell fiberglass pump cover may sound like a cost effective solution to your equipment protection problem. You probably want to just get that decision out of the way, right? Unfortunately, you've got to think long term when it comes to protecting your pump system. That equipment is likely to be in place for years or even decades. In order to properly service it and conduct repairs, you'll probably need better access than a clam-shell can provide. Additionally, you'll want your pump cover to fit the equipment perfectly, which means you may need some custom elements or penetrations. Finally, in order to save money long term, you should look to purchase the most durable option, and one that will maintain its looks for its entire life cycle.